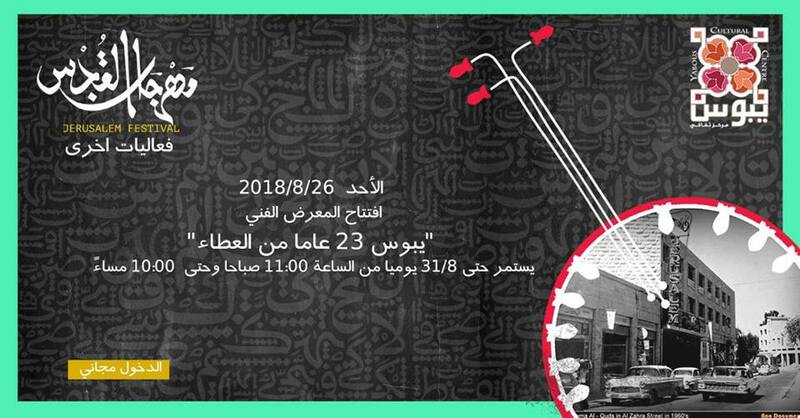 The exhibition Yabous – 23 Years of Dedication will be launched at Yabous Cultural Centre on the occasion of the commemoration of three major events: The inauguration of Faisal Husseini Hall, the 23rd anniversary of Yabous, and the launching of the Jerusalem Festival 2018. The exhibition documents the development of Yabous since its establishment in 1995. Festival 2018, has been designed to identify the development of Yabous as an organization and as a cultural center that is concerned with the preservation of the Palestinian identity and the revival of the cultural life in the city. It traces the stages of development from the early beginnings of its work in a one-room office in the Ahram building to its move to offices in the Hab Roumman building, followed by the process of the renovation of Al Quds Cinema, and the subsequent opening of the main center in Jerusalem, with several halls and facilities on Al-Zahra Street. In addition, the exhibition highlights the role of Yabous in the intellectual, artistic, and social arenas, and includes such items as awards and various honorary gifts, a photo display of its activities and artistic programs, and a documentary film about Yabous, which will be presented continuously. Jerusalem cultural arena. It has historically provided services that meet the identified (or perceived) needs and interests of the community, and at the same time, it has been able to work together with partners who are committed to sustaining the vital work of Yabous. Yabous – 23 Years of Dedication represents an opportunity to renew our commitment to openness, diversity, and creativity, and to commemorate the homeland and its history, with a particular focus on remembering Faisal Husseini. The exhibition celebrates 23 years of dedication and hope despite all the difficulties and obstacles that the center had faced during the various phases of its development. It depicts the perseverance and boldness of Yabous in designing and implementing programs, and its vision in establishing the center as a home and an open safe space for all sectors of the community. It is an affirmation of human values, human freedom, and artistic and technical creativity. Indeed an achievement to be proud of.